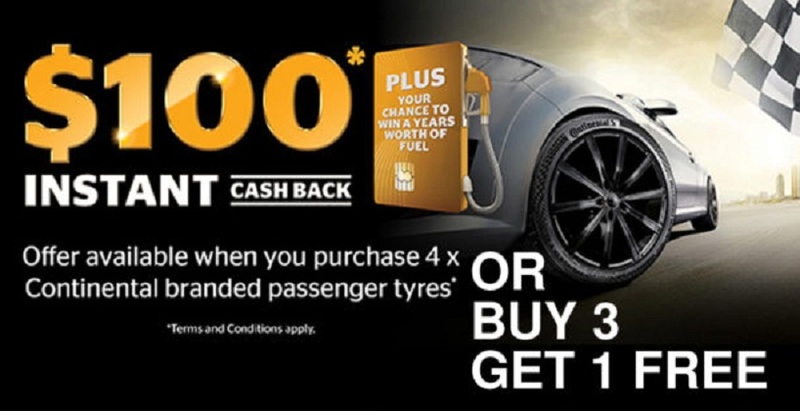 Simply purchase 4 x Continental branded passenger, 4×4 or SUV tyres 17” and above and receive $100 instant cash back! Receive an instant cash back on your invoice total at the time of purchase. Valid 1st October until 30th November 2018 or while stocks last. Offer available on a set of four (4) 17” (or larger) Continental branded passenger, 4×4 or light commercial tyres while stocks last (no back orders). Not available in conjunction with any other Continental Tyres offer. Purchase 4 x Continental branded passenger, 4×4 or light commercial tyres during the month of September and receive up to $100 cash back. Offer available on a set of four (4) Continental branded passenger, 4×4 or light commercial tyres while stocks last (no back orders).